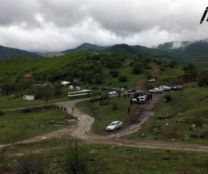 TBILISI, DFWatch–Tbilisi City Court on Friday canceled a decision by the Culture Ministry to remove the protected area status of Sakdrisi, an ancient gold mine which archaeologists say has more than 5,400 years old traces of humans. The court’s decision means that the Culture Ministry will have to review the status of Sakdrisi all over again. The non-governmental organization Green Alternative appealed the Culture Ministry’s decision of July 5, 2013, to abolished the cultural heritage status of the Sakdrisi mine. In its ruling, Tbilisi City Court argued that the ministry didn’t properly research the issue of whether Sakdrisi had cultural heritage value, according to Nino Gujaraidze, Executive Director of Green Alternative. She told journalists after the hearing that so far, the dates and terms are not known, but the ministry will have to revise the issue all over again. The court also concluded that the ministry made its decision without consulting with the archeology council at the ministry. The ministry can appeal the decision to Tbilisi City Court. The Culture Ministry has not yet commented. In spring of 2013, archeologists and non-governmental organizations learned that Russian mining company RMG Gold was about to start mining at Sakdrisi in southern Georgia. They claimed that the mine is more than 5,400 year old and it was not right to grant permission to the company. Archaeologists wanted to examine the site to confirm the presence of prehistoric traces of humans that date thousands of years back. In April, RMG Gold asked the Culture Ministry to lift the site’s cultural heritage status, claiming that it is not an ancient mine. The ministry set up a commission to study the issue. The commission decided to lift the heritage status, which was granted in 2006. The commission had 11 members and worked for 35 days. The ministry’s decision was based on their recommendation, but without consulting with the archaeology council of the Culture Ministry. Environmental activists, students and NGOs started protesting, demanding to restore Sakdrisi’s cultural heritage status and force RMG Gold to stop mining there. More than a week ago, Tbilisi City Court barred RMG Gold from carrying out mining work until it could make a final decision. Temur Chikhladze, director of the legal department at the Culture Ministry, told journalists that the ministry will most likely appeal Tbilisi City Court’s decision to the Appeals Court. He said the ministry will discuss the issue as soon as they receive the court’s decision.